Full Aggregate Broadcast Systems | Floor Coatings, Etc. Full Aggregate Broadcast Systems are multi-coat composite systems that are applied over mechanically prepared (shot blasted) surfaces and range in thickness form 40 mils to 125 mils (1/8 inch). They are always textured (non-skid) and include one or more “receiver” coats of 100% solids epoxy that are seeded to excess with a specially graded natural aggregate while still wet. This system is then sealed with another coat of 100% solids epoxy and optionally a two-part aliphatic urethane topcoat. These are medium to heavy duty systems that provide five times the impact and scratch resistance of high build systems. This is due to the addition of the broadcast aggregate that provides strength and flexibility to the epoxy in the same way as the aggregate does to the Portland cement in concrete. 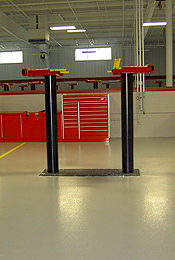 These systems can be used in dealership service areas, firehouse apparatus bays, maintenance hangars and industrial floors subject to heavy traffic. Contact us today at 302-322-4177 to learn more about our Full Aggregate Broadcast Systems.